The game of Cops and Robbers has been a rich narrative source in Cinema, and it lends itself generously to most genres, be it drama, thriller, action or comedy. When the same is combined with the folksy tale of Vikram-Betaal (Vedhalam in Tamil) that we’ve grown up hearing, it is quite evident that the audience is in for a tale of a cop and a gangster, far removed from the sensibilities of a Gautham Menon or a Mysskin. 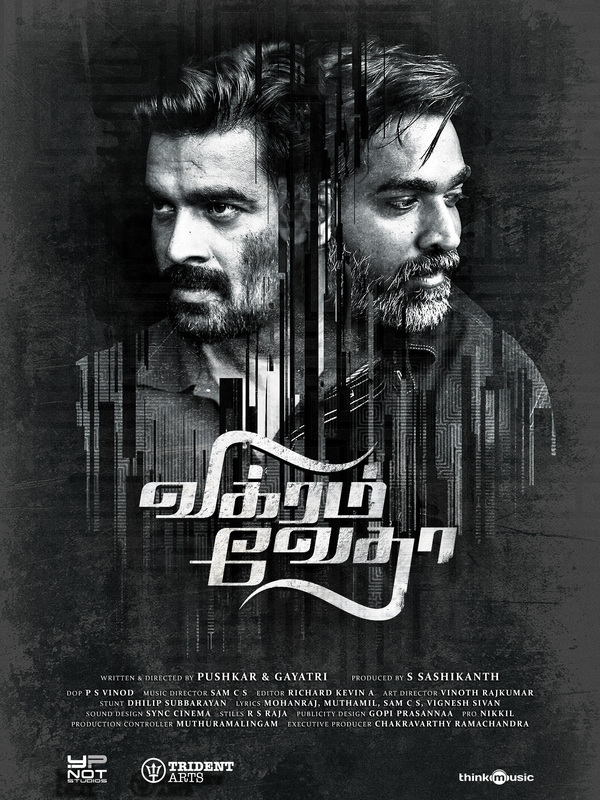 After the rather enjoyable if a tad lightweight Oram Po and Va Quarter Cutting, director Pushkar-Gayathri return from a 7 year hiatus with Vikram Vedha, and it is up to the audience to decide, was it worth the wait? Vikram (R.Madhavan) is an encounter specialist and a member of Chennai Police’s Gang Unit, tasked with cleaning up the streets of all the undesirables that are a part of the underworld’s warring factions. 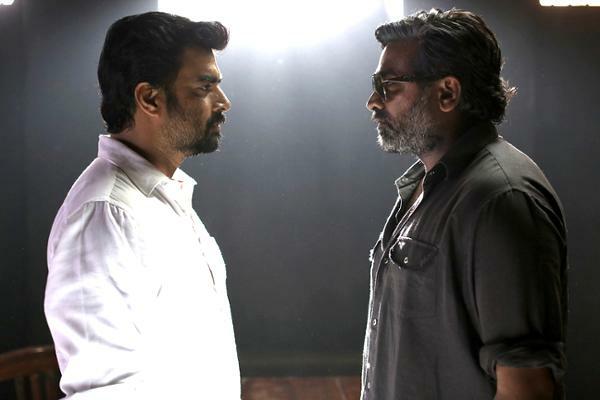 In his mission, he is pitted against the charismatic, yet extremely intelligent and vicious Vedha (Vijay Sethupathi), a dock worker turned gangster, who carved his own bloody road to the top. After a shootout that ends up with the deaths of some key members of Vedha’s gang, he surrenders himself to Vikram, with the intention of coming clean. But is that Vedha’s true intention, or does he have something more sinister in mind? It is rare to see a cop/underworld thriller where neither cop nor gangster are glorified, but are humanised with their vulnerabilities, their weaknesses and their innermost desires coming to the forefront, and for that, Pushkar and Gayathri, who are also the writers of the movie deserve a standing ovation, for they combine form and substance perfectly. From the opening sequence, right up to the end credits, they are in total control, and even when the pace slackens for a bit, you know that there’s something major in the offing, plot-wise. Add to that, a power packed soundtrack by Sam CS, with Yaanji and Karuppu Vellai (captured brilliantly during a crucial juncture of Vedha’s life), and the grimy environs of North Madras shot brilliantly by PS Vinod, and you know you are witnessing something special unfold on screen. Ever since R.Madhavan returned from his 3 year hiatus in 2015, it is quite evident that he has gotten even better as an actor, and his turn as the no-nonsense cop who will not be swayed from his duty is a case in point. But it’s Vijay Sethupathi as Vedha who is definitely going to walk away with all the applause, and why not. He slips into the character so effortlessly, and has so much fun essaying the vicious, yet charming gangster, that it’s an absolute treat to watch. Shraddha Srinath, Achyuth Kumar, Kathir and the rest of the cast put in equally brilliant performances and each and every one of them will stay with you long after you’ve left the theatre. To sum it up then, Vikram Vedha is an absolute triumph of substance over flash, and a masterclass in writing, and must not be missed.